The Ashlanders, also called the Velothi after the prophet Veloth, are Dunmeri nomads that traditionally hail from Morrowind's wilderness. In the Merethic Era, Ashlanders and other Dunmer were very much alike and on equal footing, but since the days of the First Council and rise of the Great Houses, they have steadily been forced into the poorest and most hostile lands. They travel along with their herds, camping wherever is suitable. Additional resources gained by hunting the local wildlife are used to manufacture huts, armors, clothing and general household items. Ashlander culture is the remains of the ancestor-worshipping tribal culture which the "civilized" Dunmer left behind. 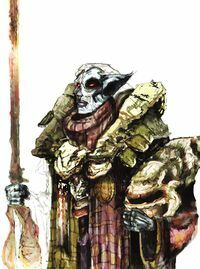 Unlike the settled Dunmer of the Great Houses, they do not acknowledge the power of the Tribunal; rather, they believe the Tribunal betrayed Lord Nerevar at the Battle of Red Mountain, and that they are kept alive by magical means not unlike necromancy. The Ashlanders are very xenophobic, shunning all outlanders, and are known to be aggressive towards foreigners in their lands. However, if an outlander performs a good deed for an Ashlander clan, he may be named Clanfriend, and thus be adopted into the tribe. The Ashlanders of Vvardenfell are divided into four clans: the Ahemmusa tribe of the Azura's Coast region, the Erabenimsun tribe of the Molag Amur region, the Urshilaku tribe of the Ashlands and West Gash regions (strong believers in the Nerevarine Cult), and the Zainab tribe of the Grazelands region. They are often at odds with each other. There are also tribes living on the mainland, such as the Kagesh and Ulath of Stonefalls, the Vereansu of Deshaan, and the Mabrigash of the Vale of the Ghost Snake. Each clan is traditionally led by an Ashkhan, whereas the spiritual leadership lies with the Wise Woman. The secrets of the Wise Women are passed from one generation onto the other. Several prophecies, in the form of verses such as the Stranger, have survived throughout the years. Many others are believed to have been distorted or lost, but, as rumor will have it, the Dissident Priests may have recorded them and thus preserved them for posterity. The Wise Women of the Ashlander clans interpret dreams as prophecies, another major difference with the Tribunal Temple. All Ashlanders in a tribe, young and small, are born into the Ancestor cult of their clan; the Nerevarine Cult is a different, small cult with the Ashlander tradition. If an Ashlander commits a crime against another member of a clan, he will be cast out of the clan. These outcasts have small camps in isolated areas; they often either become laborers in the mines or resort to banditry. Ashlanders in general are very proud, and they do not like to admit to things that shame them, especially the men; it is suspected that these tendencies may have contributed to their reputation among other Dunmer for being untrustworthy liars. Their internal culture is very polite, but they hate foreigners and have been known to be aggressive towards them (even though one of their own forgotten prophecies claimed the Nerevarine would be a foreigner). Ashlanders think it shameful to attack unarmed persons, but they will kill without hesitation an armed person who offends them or their clan laws. Those who do not know their customs risk offending them just by speaking. Challenges for sport can be declined without shame, but not challenges for honor. Honor challenges come from perceived offenses or arise from customary formal challenges of status or ritual. Ashlanders may challenge a stranger who enters a yurt without invitation; customs differ with different tribes, but polite visitors who leave when requested may be forgiven. Gift-giving is particularly important in their culture. Among Ashlanders, a gift is a token of courtesy among strangers, and affection among friends. A thoughtful gift signals the giver is cautious, considerate, and aware of the receiver's wants and needs. Unlike other factions it is not possible to advance in this one in the original game. After the Meet Sul-Matuul stage of the Main Quest you will be made a Clanfriend of the Ashlanders, and during The Path of the Incarnate you are named Hearthfriend. You can never advance from that point. This page was last modified on 12 December 2016, at 15:36.